Here is another Shaker Card using the "Sweet Centers" set that we'll be making at Friday's class -- will you join us? Don't forget that today is Week 9 of my 12 Weeks of Christmas campaign. 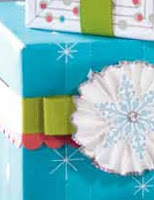 Your email will have instructions on how to make this cool ruffle embellishment, so you don't want to miss out. Before I sign off for now, a quick birthday shout-out to my darling S who turns 12 today... love you, girlie!